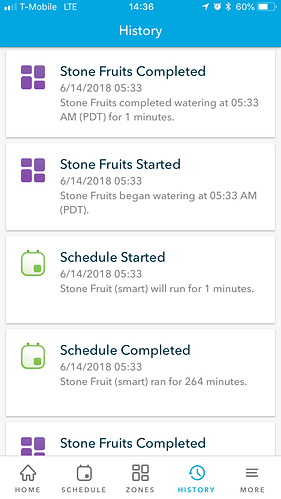 I have been running flex daily schedules on 4 zones for a while now and everything has been working great. Last week I noticed strange schedule behavior and it seems to be propagating through all my schedules. The schedules will start and run as scheduled but on completion, the schedule will immediately start again and run for 1 minuet and then quit. I would post a copy of my history showing this behavior for multiple schedule runs but can’t figure out how to do it. Any ideas why this is happening? Happens periodically for me and recently — so here’s my screen cap to help with your question. I never worried about it though. I’m not really worried either as proper watering is taking place. Just kind of curious as to why it recently started and if there is a fix in the works. @Don85207 @Kubisuro I’ll have the engineering team review and provide data around what is found. Not saying this is the fix, but I made sure both of your controllers were on latest firmware (they were not). Let’s see if that helps. I still have the engineering team reviewing. @franz thanks for taking a look. I checked and I am indeed now on the latest firmware. I’ll keep an eye on this to see if engineering comes up with anything. I was about to make a post about this same issue. You beat me to it. I have two zones on one flex schedule. After one zone completes, it is always the same zone that will show an additional run of one minute. I have not confirmed whether the Rachio is actually opening the valve for that zone for one minute, or whether it is just a display error in the app. Also noticed you were on older firmware, updated for you. Please let us know if still experiencing the issue. Flex schedule ran this morning and the problem still occurs after firmware update. A different flex schedule was set to run after the first, and the one minute additional timing interrupted the next schedule. Zone ‘back lawn’ in flex schedule ‘Lawn Flex’ ran for 159 minutes, after which flex schedule ‘garden’ starts the zone also named ‘garden’. 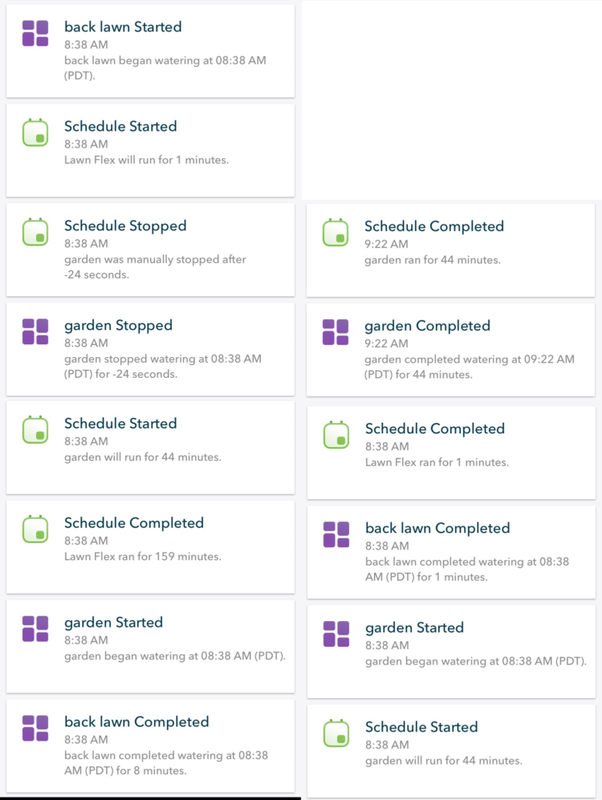 The Rachio decides it needs to run ‘back lawn’ for an additional minute, so interrupts the garden schedule to run for one minute, before resuming garden. 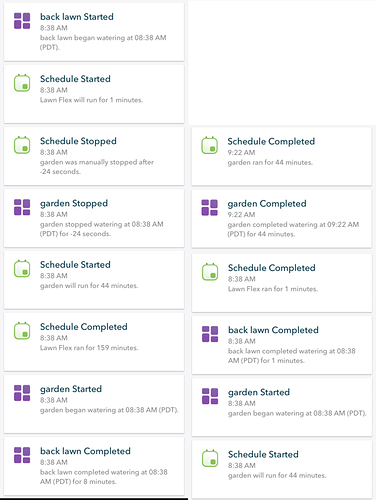 I still can’t confirm whether the valves are actually opening and closing on this one minute run and whether the garden actually started before the interruption. Almost looks like the schedules are running on top of each other and it is confusing the controller. Thanks for following up. I have our engineering team reviewing this issue. I am seeing the same issue. All my zones will run and in the last zone it will only run 1 minute. I also deleted the schedule and made it again with no luck. We believe to have identified the cause of this issue and will be promoting a fix today or tomorrow. Should I be watching for a firmware update? Thanks for the quick response on this! No it was a cloud fix. Should be resolved, please let us know if still experiencing the issue. Outstanding, thanks to you and the team. 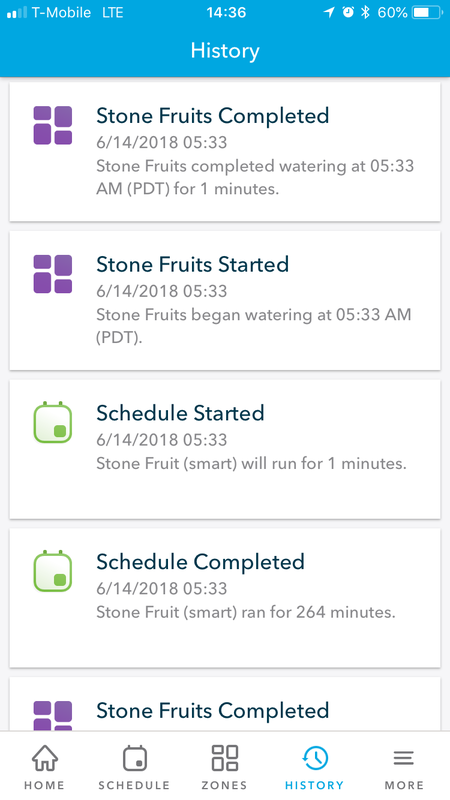 I had some zones water today and the issue seems to be resolved. @franz Since this was mostly about outdated firmware, I checked and I too am out of date running: iro2-firmware-5-82. Does this have to be updated from the Mothership or can it be done manually? AND how many revs has there been that I have missed that may have help with the issues I am having? This was an issue with the cloud software and was not a firmware issue. Your controller should have the latest firmware now.